Would you like to visit the Forum Romanum in Rome? All the tips and tickets for visiting the Roman excavations of the Forum Romanum and the adjacent Palatine hill. Address The Forum Romanum has two entrances: Via della Salara Vecchia, 5/6 and Via di San Gregorio. You can also visit the Forum Romanum via the Palatine Hill. Tickets You can visit the Forum Romanum and Palatine hill with a combined ticket from the Colosseum. The combined ticket is valid for two days. 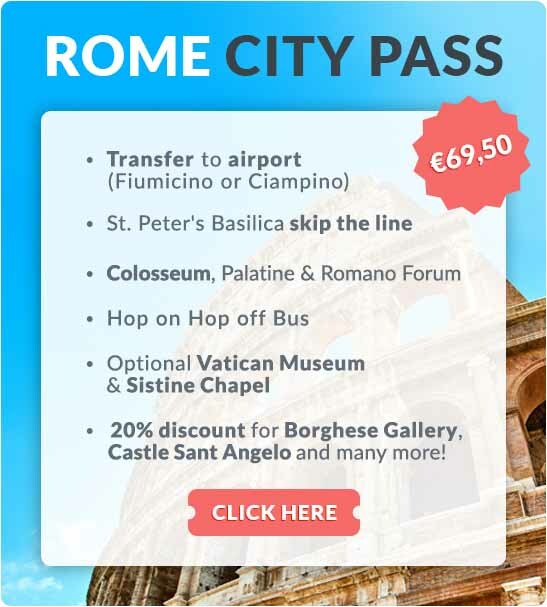 Tip 1: The Rome City Pass is a combined ticket for all the tickets you need for your city break to Rome (includes Colosseum, Forum Romanum, St Peter's, hop-on-hop-off bus, Sistine Chapel). More info Rome City Pass. Tip 2: You can book a guided tour in combination with the Colosseum here. Attention No food or drinks are sold on the Forum Romanum and Palatine hill. There are taps available where you can refill bottles of water. Please keep in mind that your visit can easily take a few hours. It was not until the 19th century that excavations of the centre of the Roman empire at the base of the Capitol finally began. During the reign of emperor Augustus (27 BCE – 14 CE), ancient Rome was already home to over a million Romans, and the Forum Romanum was the political, legal and religious centre of the Roman Empire. During your visit, you walk by the many ruins of the Forum Romanum. Unfortunately, many buildings were damaged by earthquakes and plundering after the 7th century, but also by construction of palaces and churches such as St. Peter’s Basilica. However, the excavations can still tell you a lot about the history of the Roman Empire and no trip to Rome would be complete without a visit to the Forum Romanum. You get to the Forum Romanum via the Via Sacra, the oldest and most famous road in Rome. The name ‘Sacred street’ is derived from the many temples and other holy sites that lined this street. Examples are the round Temple of Vesta, the Temple of Saturn, the basilica of Maxentius, and the official residences of the pontifex maximus, the arch of Septimus Severus and the rex sacrorum. You will also see the remains of arches, the speaker's platform, market halls and much more. Tip: Capitoline hill offers a magnificent view of the Forum, giving you a good overview of the whole. It even has lovely lighting at night. Forum of Caesar (Foro di Caesare) with the temple of Venus Genetrix. Tip: a special multimedia show is held on the Forum of Caesar in the evenings. It tells a story of the life of Julius Caesar with visual effects and sounds. Info and booking. Forum of Augustus (Foro di Augusto) with the temple of the god of war Mars Ultor. Tip: a special multimedia show is also held on the Forum of Augustus. It tells a story about Ancient Rome with visual effects and sounds Info and bookings. Palatine hill is one of the seven hills of Rome. During the 9th century BCE it became a residential neighbourhood that would later be home to important Romans such as Cicero, Crassus, Augustus and Tiberius. This last emperor ensured the 43-metre high hill's reputation as imperial residence. According to legend, Rome was founded by Romulus on Palatine Hill in 753 BCE. Today, Palatine Hill is a major archaeological park and connected to the Forum Romanum. In the centre of Palatine hill, you can find – among other monuments – the impressive buildings of emperor Domitian (Domus Augustana) and the 16th-century gardens of cardinal Alessandro Farnese. The Antiquarium can also be found on Palatine Hill. This museum contains models of the first settlements and archaeological finds. Where is the Roman Forum in Rome?